There are a lot of places that are more specialized than I am in certain kinds of long gun work, and without reservation I will tell you that some of them will be able to do certain things better and/or for less. But, I believe you will see some things here that are not offered elsewhere. When you want something that nobody else is doing or will consider doing, or doesn't think can be done, maybe I can help. Shotguns-The Browning BPS has never been seen as a fighting or action competition shotgun. That's a shame, because with a few modifications, it makes a great one. When I needed to upgrade to a modern pump from the Winchester '97, I looked at everything I could find. I looked outside the boundaries, being careful to not be constrained by what everybody else was using. My three main criteria were handling related: a) it must have a short, smooth stroke; b) ergos must be good- safety and slide release easily reached and actuated; c) there must be no %#&%$@#!! )&$# cartridge lifter, acting as a loading gate to the magazine. As popular as certain models of shotgun are, many have the lifter/gate which must be depressed to load the magazine. These tend to act like Chinese fingercuffs, trying to skin the unfortunate thumb that follows a little too closely behind the cartridge it is pushing in. The BPS has none, and, in fact, the magazine loading area is long enough that loading two at a time is possible, by dropping a cartridge on to the bottom of the bolt of the overturned shotgun, pushing it in with a second cartridge, which then follows it in. You have just loaded two for the price of one, so to speak. As a bonus, the BPS has an ambidextrous safety, if that is important to you. It also has bottom ejection, of which much is made, but the advantage is not that the empties come out the bottom, nor even that the receiver is enclosed (although I'll admit that doesn't hurt). The real advantage is that ejection is very positive and it is not necessary that the slide be racked hard and fast to get clean ejection. The one huge, glaring disadvantage of the BPS and other bottom-ejecting shotguns in a fighting/competition role, is that a single round cannot be quick-loaded into the chamber when the gun runs dry, as there is no ejection port giving the shooter direct access to the chamber. The action of the gun must be closed, a round loaded into the magazine, and racked into the chamber-- slow and cumbersome. Some tactical trainers recommend against the habit of dropping a round directly into the chamber because a) you weren't supposed to let the gun run dry in the first place, and b) you are using two loading procedures: one for an empty gun and one for a partially loaded one. Be that as it may, when the shotgun has been run dry, and you have just heard that very loud CLICK, it is faster to drop one in with the action open and close it than it is to put one in the magazine and rack it in. There could be a time when one round NOW is more meaningful that one round in "now-point-eight" seconds with the satisfaction that you did it like they told you. 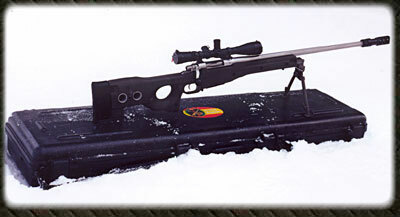 Toward this end, the BPS and the Ithaca Model 37 pictured here have the loading port cut into the receiver. Some other odds and ends...not things I've done dozens of, but again, examples that show the limits may be a little further out than you thought; just because there is not a product in somebody's catalog, or just because you haven't seen it done before, does not mean it can't be done. Picture 4: Ruger 10/22 with left-hand cocking knob and trigger-finger-tip mag release. 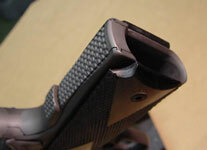 Picture 5: Pop-up tritium sight for AR-15. Standard night sights for these are too wide for a fine sight picture. With this you can stow the night sight and use the thin front sight for precise, daylight shooting, or pop the night sight up - it is detented in both positions. Picture 6: Trigger-finger safety for Kalashnikov. Helps with the horrible ergonomics of manipulating the safety on these otherwise decent rifles. This one also has a notch in the safety lever and cocking handle that work together as a bolt hold-open. Picture 7: Muzzle brake for bolt guns. 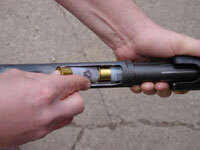 This attaches without threading the barrel, removing the possibility of collapsing the bore by over-tightening. Easy on and off and very effective. Pictures 8 and 9: Brakes machined directly into the barrel- two AR15's in this case. Checkering is classic, and it works, but it is not the only option. Picture "A" shows what I call Conamyds. This treatment gives a very solid grip, but the amount of traction is more proportional to the amount of pressure you exert in grasping the pistol. That is, you are not committed to an improper grasp if your draw is imperfect, like you might be with very sharp 60-degree checkering. You can loosen the grasp and get everything where it needs to be; you're not stuck. But, with a normal firing grasp, you are locked in and stable. Another advantage to this form is that, unlike checkering, there are no 90- or 60-degree V's, which in some cases could promote cracking and failure. I have never seen this happen in a properly done checkering job, but, if for some reason things should get too thin, it definitely could happen. On a 1911 frontstrap, for example, whose thickness was towards the low end, say .055, a checkering job of 20 LPI at 60 degrees would theoretically leave you with a frontstrap held together by .012 bands of metal. Not enough. Conamyds are .010 to .020 deep, depending on the amount of sticktion desired, frontstrap thickness, and frame material. Shallowmyds (Picture "B") are another alternative, developed specifically for thin-frontstrap conditions, especially on aluminum frames. Even with a loupe, it can be difficult to tell them from regular 90-degree checkering, but they are only half the depth. What makes them work is that they are still pointed, at 90 degrees, but the valleys are radiused. They give about 85% of the traction of regular 90 degree checkering. You can picture Shallowmyds this way: you are standing in the Egyptian desert, in front of a row of pyramids which are touching at the base. You take a long rope and go to the top of each one, and when you're done, that rope is draped over the peak of each one, but sags exactly halfway to the ground between pyramids. Go back to your original vantage point and look-- that rope is now a line describing Shallowmyd geometry. Any of the patterns I do can be applied to the backstrap as well, and depending on your personal tastes can be run upward to cover the memory-bump area of a 1911's grip safety, and run off the sides of the mainspring housing onto the frame. The Conamyd job pictured has both. This gun reflects my personal liking for a slender 1911 lower frame; the mainspring housing has been re-angled and reduced as much as possible. The side-to-side radius is larger, giving a flatter surface side-to-side. This gives the hand more "wrap" on the pistol and more area for a positive purchase. People with larger than average hands might not get any benefit from this.